Tourists and snowbirds have gone, and profits dwindle – time to beckon people inside. 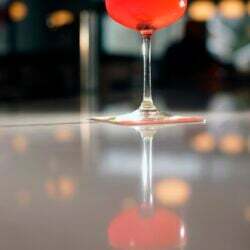 Diners who attended Gather’s “Dinner with Dracula” first slaked their thirst with cocktail called the Neck Biter – vodka with blood orange and blackberry juices. Then they supped on “Van Helsing’s Cure,” a roasted garlic and white bean bisque. 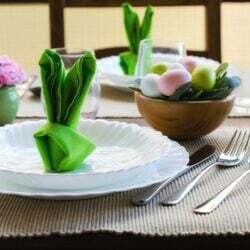 The main dish? “Steak Through the Heart,” a country fried steak served with artichoke heart stroganoff. The clever three-course dinner was a collaboration with Royal River Community Theater, which put on a Dracula-themed radio show to spook diners while they ate their “Bleeding Ganache” dessert. The idea was to bring people into the Yarmouth restaurant during the bleak winter months, when bottom lines are downright frightening. Winter has always been a tough season for Maine restaurants in seasonal communities along the coast. Once tourists go home, making enough money to get through until spring can be a challenge. Towns like Yarmouth, where snowbirds fly south for the winter, can also suffer. This year has been especially difficult, since winter started early with snow on Halloween. Keeping diners in the seats requires creativity – cue the special events, exclusive dinner offers, and happy hour specials that run only during snowstorms. The bar at Scales in Portland sells $1 Maine oysters from 4 to 6 p.m. Sundays through Thursdays, hoping some customers will stick around for dinner. Chaval in Portland is making paella on Monday nights. And every time the weather is crappy, Novare Res Bier Cafe in Portland runs “Crappy Hour” specials, such as a $5 Crab Rangoon Grilled Cheese and a discounted beer. Getting through winter was harder 10 years ago, restaurateurs say, before Portland’s restaurant boom took off, and locals tended to hunker down at home on frigid February nights. Back then, even James Beard Award winner Rob Evans, former owner of Hugo’s, offered two-for-one chef’s tastings in winter to lure people in the door. Arlin Smith of Big Tree Hospitality, who worked for Evans and is now part-owner of Hugo’s, Eventide Oyster Company and the Honey Paw, says getting through winter is easier these days. Outside: Cold and snowy. 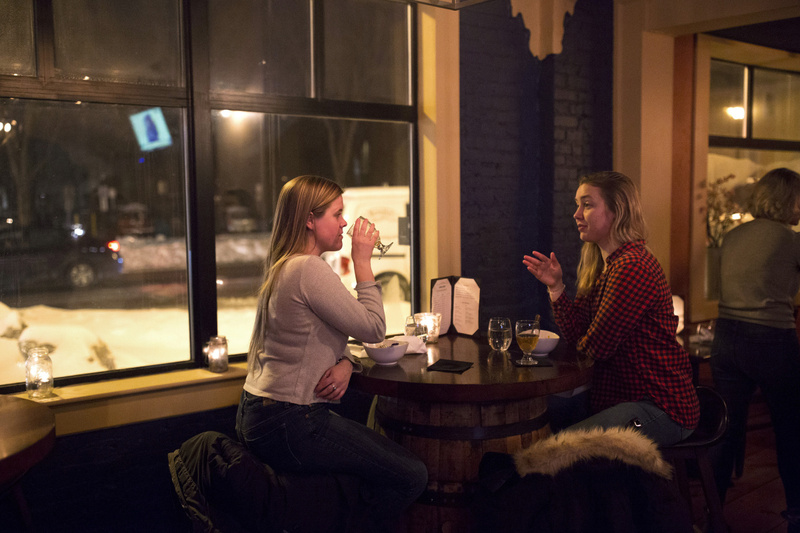 Meanwhile, inside Little Tap House, Noelle Baker, left, and Robyn Waugh fortify themselves with beer and some happy hour snacks. The Honey Paw offers items that aren’t on the normal menu during its 4 to 6 p.m. happy hour, and Eventide puts discounted burgers and comfort food specials on a wintertime menu that is served only after 9 p.m.
Other bars and restaurants also tie enticements overtly to the season, running specials during snowstorms or whenever their city calls a parking ban. The Roma on Congress Street in Portland coaxes neighborhood residents out during snowstorms with the promise of a three-course dinner for two, including a bottle of wine, for just $50. The restaurant offers the same deal every Monday for $60, knocking $10 off on snow days, according to manager Matthew Kurt. Kurt said customers learn about the discounted dinner through word of mouth and social media. He also makes sure his servers tell people about the deal when they come in. The specials will probably end sometime in April, he said. Without the specials, Kurt said he might be forced to cut back on staff hours in the winter. “This week alone, because the temperatures have dropped, I’ve had to cut a server here and there,” he said. 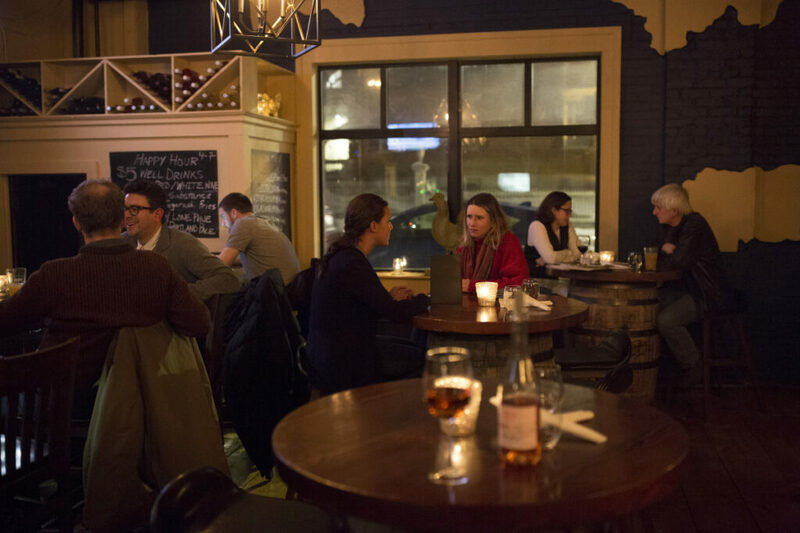 A few blocks over at the Little Tap House, customers are treated to an all-night happy hour whenever the city calls a parking ban. Restaurants and bars have long been frustrated by parking bans because they keep people at home as if they were avoiding a zombie virus. Between people trying to follow New Year’s resolutions by avoiding food and drink, and the just plain cold, “winter is expensive,” said Brianna Jaro of Little Tap House. Fewer customers mean fewer profits, but Jaro understands that some people want to hibernate. “When it’s 2 degrees outside, I sure don’t want to leave my home,” she said. But, with the right incentives, some Little Tap House fans will venture out. Thus the all-night happy hour that includes a hot toddy special. The Vintage Room in Camden experiences a significant drop in business when the summer tourist season ends, but specialty nights help bring locals in. 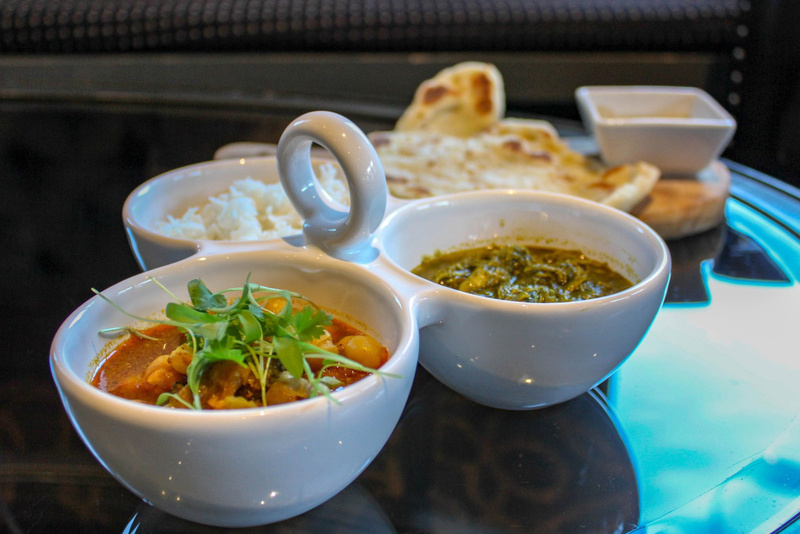 “Indian Night,” with curries, rice, chutney and naan, is being held every Thursday through March 8. The parking ban nights bring in twice as many customers as does an ordinary winter night, Jaro said. Other specials that will run through February: $5 draft beer on Sundays and Mondays, and $15 bottles of wine on Wednesdays. If winter is tough for Portland restaurants, imagine how hard it must be for smaller seasonal communities along the coast, which can be like ghost towns in January and February. Consider the Vintage Room in Camden, an intimate, 30-seat lounge that serves small plates and is part of 16 Bay View, a luxury hotel that goes from 100 percent occupancy in summer to 30 percent in winter. “We go from being extremely busy in summer to just dying off,” said chef and Food & Beverage Director Andrea Barbour. Some winter nights, she says, no one comes into the Vintage Room at all. To offset that, Barbour started holding specialty nights last year, and the locals’ love of curries and tacos has helped turn things around. Before, sales at the Vintage Room might be 90 percent beverages and just 10 percent food, Barbour said. Now, she estimates, food represents 70 percent of total sales on some winter nights. Every Thursday from Jan. 23 to March 8 is “Indian Night,” when $14 buys two housemade curries, freshly baked naan, basmati rice and chutney. (Barbour plans to add samosas, pakoras and desserts to the menu soon.) Camden doesn’t have any Indian restaurants, so the very first night sold out, and it has sold out almost every night since, Barbour said. Similarly, Taco Tuesday, which will be held through March 26, is popular for its $5 tacos, margarita specials and housemade chips and salsa. Barbour hopes to add more themed nights in the near future, including “Stock Market Mondays” for local bankers, business people and “stock enthusiasts.” She plans to bring in a couple of experts on the stock market to answer diners’ questions. “I don’t think we would serve food in the winter without this,” she said. Restaurateurs say that to get the best results, winter promotions should be consistent – Chappell suggests they last more than three or four weeks. In November, Chappell started a “Girls’ Night Out” promotion at Gather, where business drops off 10 percent in winter, that offers half-price bottles of wine to women who come in with their friends. It will last through the winter and “give people a reason to go out midweek,” he said. 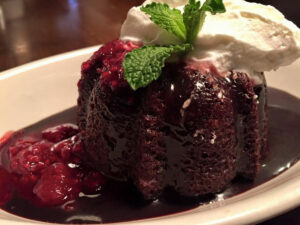 This “Bleeding Ganache” was the dessert served at a “Dining With Dracula” dinner last winter at Gather in Yarmouth. Chris Gould, chef/owner of Central Provisions and Tipo in Portland, says winter is harder on Central Provisions, which is in the Old Port, than it is on Tipo, a neighborhood place. One recent weekday, Central Provisions served dinner to 80 people, “which is not a lot,” Gould said. “The weekdays are definitely slower,” he said. To fill more seats in the winter, Central Provisions offers late-night specials to people in the restaurant industry, such as the “lunchbox series” that featured high-end takes on cafeteria food – think foie gras sandwiches and kielbasa corn dogs. Other restaurateurs agree that holding special events in winter, in addition to bringing in revenue, can also help keep staff creatively engaged and, well, on staff. Winter has always been an issue at DiMillo’s On the Water in Portland, where a summer lunch deal targeted to cruise ship tourists can draw 500-plus customers, according to Steve DiMillo. In the winter, on a good day, 130 people may come in for lunch. But the DiMillos stay open in winter, mostly so they can hold onto staff for the following summer season. This winter, DiMillo’s is advertising what it calls “Locals’ Season,” which will probably run into April. 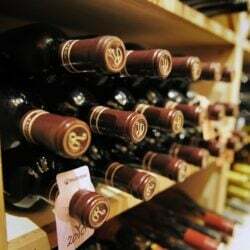 It includes happy hour specials such as $3 craft beers on Mondays and $5 glasses of wine on Wednesdays. The chef has also created some early dinner specials that include “stick-to-your-ribs” winter comfort foods, like spaghetti and meatballs, that are not normally on the menu, DiMillo said. The dinner specials – three courses for $25 – are offered from 3:30 to 5:30 p.m.
It’s particularly tough for DiMillo’s to capture diners – especially elderly diners – in winter because they have to walk across the restaurant’s giant Commercial Street parking lot, where the wind whips across the flat surface.